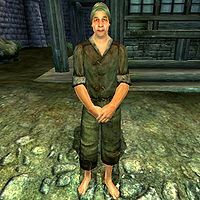 Cosmus the Cheat is an Imperial commoner who tries to get by as a beggar in Bravil. His bedroll is located just behind The Fair Deal and he sleeps there every night between 10pm and 6am. After waking up, he heads for the Great Chapel of Mara, where he tries his luck near the side of the chapel for four hours. At 10am, he can be found near the Northern Gate and at 2pm in the area near A Warlock's Luck. If he has found anything to eat, he will cross the bridge at 6pm and take his dinner on the bench in front of the Lonely Suitor Lodge. If not, he will live up to his nickname and steal from Wretched Aia's food bag in the southwestern corner of Bravil. If he finds some food in there, he will eat it at the bench, otherwise he will wander around hungrily until it's time to go back to his bedroll at 10pm. Cosmus is infected with the disease Chills and you can be infected should you engage him in combat. His possessions reflect his stature: he wears a collared shirt and a pair of sack cloth pants and carries a tan cup. He is one of the "poor and suffering" to whom you must speak in order to receive Speechcraft training from Tandilwe. Ironically, while Cosmus steals from Aia's foodsack, she will actually do the same to him - making both of them eat each other's stolen food in front of the Lonely Suitor Lodge. On occasion, he may fall from one of the bridges joining the two halves of the town or walk right off the large rock to the left of The Warlock's Luck, which often results in him inadvertently killing himself in the process due to his low health.